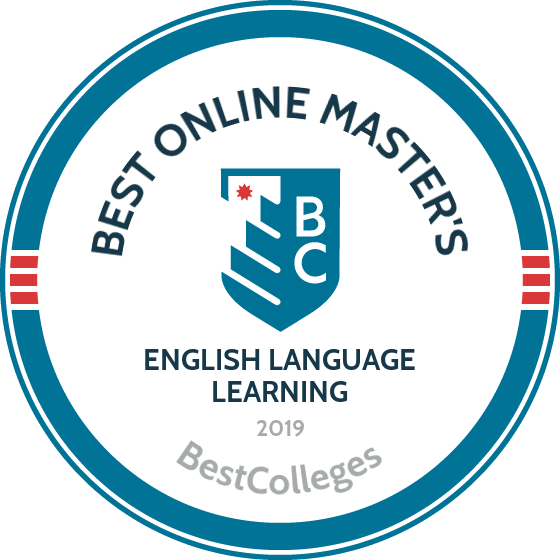 What Are The Best Online Master's in English Language Learning Programs? What Else Can I Expect From an Online Master's in English Language Learning Program? By and large, schools design their online master's in English language learning programs for teachers and administrative leaders interested in obtaining or strengthening their teaching skills. Learners discover how to instruct and create a curriculum for English as a second language (ESL) or English language learning (ELL) programs. As the nation becomes more multicultural, the need for ESL teachers continues to increase. Schools must also learn to create programs and initiatives that engage students who are not native English speakers. The Bureau of Labor Statistics reports that demand for teachers is growing by 8%. In addition to a career in education, graduates from master's in English teaching programs may find work in a variety of industries, such as tutoring or translating. The best online master's degree in English language learning programs are designed for teachers interested in expanding their ESL skills. Currently licensed teachers learn new techniques that they can incorporate into their daily interactions with students. Administrators learn the art of creating an effective ESL curriculum. Both teachers and administrators develop a unique perspective that helps them connect to ESL students. They also learn the differences between teaching English in foreign countries and teaching in countries where English is the native language. Most online master's in English language learning programs require applicants to hold a bachelor's degree and a valid teaching license. Applicants should have some teaching experience and/or a valid administrator's license. State law requires teachers to have work experience prior to applying for a teaching license. Typically, prerequisites vary according to the school and online program. Some programs offer certification and degrees simultaneously. WHAT ARE THE ADVANTAGES TO EARNING MY ENGLISH LANGUAGE LEARNING DEGREE ONLINE? An online degree program provides the flexibility and convenience ESL teachers need. Learners can work individually at their own pace or within a group. Learners can also work full or part time while completing a program. Most programs require students to dedicate a certain number of hours per week to coursework. Instructors work with students to provide direction and help when necessary. Academic advisers guide students and ensure they stay on track to graduate. The online TESOL master's program at USC builds on three academic pillars: theory, practice, and mastery. Students develop a working knowledge of the core theories and competencies used in the field, and apply them through teaching, research, and observation. Learners master these skills by working with faculty, peers, and teachers in the field. USC's TESOL master's program explores a variety of concepts and skills, focusing on instructional approaches, language acquisition, the structure and use of language, and the social contexts in which students learn and use language. Approaches include learner-centered teaching, task and problem-based learning, and online learning. Acquisition covers topics such as first and second language learning, multilingualism, and immersion models. Structure and use includes phonology, language awareness, and morphology, grammar, and syntax. Social contexts explore critical race theory, community wealth, and activity theory. TESOL students complete at least 24 credits, though they may pursue two additional credentials during the program. The English Language Development Credential requires an additional four credits, and is specific to the state of California. The Gifted Education Certificate requires six additional credits and focuses on the needs of gifted and talented students. Applicants must hold a bachelor's degree with a minimum 3.0 GPA, and demonstrate effective verbal and written communication skills. Applications must submit a resume, a personal essay, and two letters of recommendation. Prior work in education is not required, but applicants must show that they can meet the program's rigorous demands. WGU offers a TESOL International Association-recognized online English language learner (ELL) master's program for licensed K-12 teachers, which leads to an ELL or ESL endorsement. Students prepare for careers as highly valued specialists in classrooms with non-native speakers. The program consists of 11 courses, covering English language learning and research fundamentals, and culminating in a teacher work sample. Courses include language production and acquisition, assessment theory and practice, and planning instruction. Distance learners must complete at least 15 observation hours in a classroom in their area. For their capstone project, students conduct a teacher work sample, in which they design a curriculum to meet a designated educational need. Most students complete the program in about two years, but some complete it in as little as six months. WGU offers a personalized, flexible program in which students complete one course at a time, at their own pace. Once students demonstrate mastery of the course material, they move onto their next course without having to follow a predetermined schedule. WGU assigns each student a program mentor, who helps them navigate the process from start to finish. This personalized attention ensures students benefit from their previous knowledge and experience, and move through the program at a comfortable pace. VIU offers an online TESOL master's degree, which incorporates employers' recommendations to ensure the curriculum stays current. Each year, faculty from the VIU School of Education meet with program adviser boards to keep up with changing classroom trends, preparing program graduates to enter the workforce right away. Students complete 12 courses in the program, seven of which are required and cover topics such as applied linguistics, language acquisition, and curriculum and materials design. The remaining five elective courses include teaching pronunciation, program administration, research models, and materials development for online learning. Students also complete a practicum internship experience, where they reflect in their Summative Concentration Portfolio at the end of the program. The program follows a traditional format, and full-time students typically complete it in two years. Students who take fewer than three courses each semester take longer to complete the degree, and those who want to take more than three courses each semester should check with the department for more information. Courses are available both online and on-campus, and some may offer a hybrid option. Applicants should hold a bachelor's degree in any field, and must submit a 500-word statement of purpose reflecting their professional goals and interest in the program. Applications must include two letters of recommendation, and for non-native English-speakers, evidence of language proficiency. The online TESOL master's program at Webster offers students two track options: the ESL/EFL education emphasis, and the K-12 English language learner (ELL) education emphasis. The former serves aspiring educators and does not require prior teacher licensure, while the latter caters to established, licensed teachers. Students may also pursue additional Missouri ELL certification. Students explore topics including the English language and its systems, theories of language acquisition, and curriculum design. The 33-credit program consists of seven required courses, three electives, and a practicum. Students can complete their courses online or on-campus in St. Louis or Missouri, or at select campuses around the world, including in Athens, Greece; Bangkok, Thailand; and Tashkent, Uzbekistan. Applicants must hold a bachelor's degree with a minimum 2.75 GPA, and international students must submit TOEFL scores of at least 575. Native speakers should have at least two semesters of a foreign language (with a B grade or higher), but this is not required. Applicants must also submit essays discussing their teaching philosophies and the values they believe make educators more effective in teaching English as a second language. Founded by the Sisters of Loretto in 1915, Webster originally operated as a women's-only college, and one of the first Catholic institutions west of the Mississippi River. Since its first graduating class of two students in 1919, Webster has graduated over 7,000 alumni. The online TESOL master's at APU provides a Christ-centered approach to teaching English as a second language. This program is available at the university's Azusa, California campus, and online and in a field-based format for students who are currently teaching abroad. The online program typically takes 1.5 years to complete. Students develop the skills and knowledge to address English learning in diverse, intercultural settings. By focusing on intercultural sensitivity, APU's program trains educators to adapt to a variety of environments, while respecting the challenges faced during language acquisition and the needs of diverse students. APU's online, asynchronous courses give students the flexibility to complete their work on their own schedules. The online program uses a cohort model in which groups of students who begin the program together move through the same courses at the same schedule. Students develop a sense of community with each other, and provide each other with support. Learners may select electives that fit their personal and professional goals, and each student completes a practicum in their desired location. APU, an evangelical Christian university, centers its teaching and programs within its understanding of Christian theology. One of the largest Christian universities in the nation, it enrolls over 10,000 students in 150 programs. APU holds accreditation from the Western Association of Schools and Colleges Senior College and University Commission (WSCUC), along with various programmatic and professional accreditations. Texas A&M's master's in bilingual education, an online program focused on teaching English- and Spanish-speaking students, explores issues of bilingualism, biliteracy, cross-cultural awareness, and the process of teaching and learning in such environments. This program is part of the Center for Research & Development in Dual Language Education (CRDLLA). Founded in 2013, CRDLLA focuses on supporting second-language learners by developing education materials, providing professional development for teachers and conducting research. The center works with education-related state and federal organizations, and maintains partnerships with school districts and other institutions in the private, public, and nonprofit sectors. Texas A&M's program requires 36 credits, and students can choose either a thesis (MS) or non-thesis (M.Ed.) option. Both options feature the same required courses, covering topics such as program methodologies, assessing and monitoring bilingual students, and research techniques. Students must complete a field practicum and a directed study. The thesis option covers the remaining six credit hours, and the non-thesis option comprises a second practicum and second directed study. Applicants do not need to submit GRE scores, though non-native English speakers must submit TOEFL scores. Students can apply during three windows, ending on October 15th for the spring semester, March 22nd for the summer semester, and March 22nd or July 1st for the fall semester. Admissions officers give preference to earlier applications. UMBC offers an online master's in TESOL through joint efforts from the U.S. Department of Education and the Department of Modern Languages, Linguistics, and Intercultural Communication. Founded in 1979, the program employs methodology and applied linguistics to train current and future educators. Students choose between thesis and non-thesis options. In the non-thesis option, learners design a comprehensive instructional degree utilizing the knowledge and skills they developed over the course of the program. In the thesis option, students instead create unique contributions to the TESOL field based on their own research. Both options require courses in human learning and cognition, cross-cultural communication, and methods and techniques for teaching English as a second language. Electives include testing and evaluation, American English grammar, and bilingualism. Applicants must hold a bachelor's degree with a minimum 3.0 GPA, and submit either GRE or Praxis test scores. Non-native English speakers must submit TOEFL, IELTS, or PTE scores. All applicants must include a statement of purpose that addresses their interest in the field, along with three letters of recommendation. Applications for the fall semester are due by August 1st for domestic students and April 1st for international learners. Spring semester applications are due by January 1st for domestic students and November 1st of the previous year for international students. Domestic students can also apply for the summer semester before May 1st. Students who miss these deadlines may take up to two courses as nondegree students; if they matriculate into the program, these courses will then count toward the degree. The University of Northern Iowa offers two online TESOL master's programs: one focused on teaching English, and another focused on teaching English or Spanish. These programs are part of the Department of Languages and Literatures, and both require 33 credits to complete. Both programs prepare graduates to work in K-12 education, ESL programs abroad, or community colleges. Both explore second language acquisition, computer-assisted language learning, and applied linguistics. The Spanish portion of the TESOL/Spanish program further explores Latino/a culture and translation, and the structure of the Spanish language. Neither program includes licensure to teach at the primary or secondary level, and students seeking licensure should check with the state in which they wish to teach. The TESOL program requires that native English speakers show proficiency in another language by earning at least a C grade in a second-semester language course, or by having passed a relevant examination. Non-native English speakers must submit a TOEFL or IELTS score to demonstrate proficiency. Applicants to the TESOL/Spanish program must provide a statement of purpose in Spanish, along with three letters of recommendation in either language. Non-native English speakers must provide TOEFL or IELTS scores. Founded as the Iowa State Normal School in 1976, UNI began as a teaching college. It has since expanded to more than 90 programs, but still emphasizes hands-on learning. Enrollment, starting with only 88 students in 1876, had grown to nearly 12,000 students as of 2017. The online master's in ESL at Newman University approaches the topic from both a classroom perspective and a system point of view. The program explores various systems for teaching English, providing graduates with the pedagogical and leadership skills they need to succeed in the field. The School of Education at Newman emphasizes knowledge, caring, reflection, vision, collaboration, and ethics. Master's in ESL courses cover topics including cultural diversity, research and applications, advanced curriculum and instructional methods, and leadership coaching techniques. Students must also complete a practicum, which provides hands-on experience and contextualizes the knowledge and skills developed in the program. Each of the program's 11 courses last eight weeks, and are taught in a flexible format that includes face-to-face, webcam, or streaming video and online modules. These methods allow for feedback and interaction between students and their professors. The program takes 1.5 years to complete on average. This program serves working teachers, so applicants must hold a bachelor's in education with a 3.0 GPA and a teaching license in the state of Kansas. Applications must include a 300-word statement of purpose and two letters of recommendation. Newman University holds accreditation from the Higher Learning Commission, the National Council for Accreditation of Teacher Education, and the Kansas State Board of Education. Newman, a Catholic institution, focuses on academic excellence, human dignity, compassion, and service to community and others. The online master's in ESL at UNCW operates as an intensive program for certified teachers. The program serves teachers who wish to earn TESL certification and those who have already done so and wish to improve their expertise in the field. Courses in this 33-credit program include ESL assessment, linguistics, and methods for second-language learners. Students prepare to work and demonstrate leadership in diverse K-12 environments. Graduates can implement effective teaching strategies, and are equipped to take the Praxis II ESOL exam and apply for ESL teaching certification in North Carolina. Other states may impose different licensure and certification requirements. Most of this program's online courses follow a synchronous format, requiring students to participate at set times each week. Meetings generally take place in the evening. The degree usually takes two to three years to complete, depending on students' individual schedules. Accredited by the Southern Association of Colleges and Schools Commission on Colleges, UNCW enrolls more than 17,000 students. The research-focused university secured more than $11.4 million in research funding for the 2016-17 fiscal year. The Department of Instructional Technology, Foundations, and Secondary Education — which hosts the ESL program — engages in a variety of community engagement programs, including Dropout Prevention Coalition and the African Americans and Education Conference. When Hamline University opened in 1854, it held classes for 73 students on the second floor of a general store in Red Wing, Minnesota. The university soon moved to its current location in Saint Paul and now enrolls more than 3,500 undergraduate and graduate students and offers over 50 degrees. U.S. News & World Report ranks the university as number 13 of 172 schools in the 2019 Best Regional Universities Midwest Rankings. Hamline University holds accreditation from the Higher Learning Commission. The university's education department offers a TESOL master's online with two concentration options: teaching adults and teaching K-12. The K-12 concentration serves students working toward a Minnesota K-12 ESL teaching license. Learners progress through the program at their own pace, and can enroll in online or on-campus courses. The degree comprises 36 credits: 28 in core coursework and eight in major courses. The curriculum includes courses in advanced linguistic analysis, pedagogical grammar and discourse, phonetics and phonology, language and society, and exploring learning language and second-language acquisition. Hamline University offers three start dates for the MA in TESOL program: February, June, and September. Most students graduate in as little as 20 months, or just six terms. Students can choose to complete a capstone project or write a thesis to earn the degree. ASU offers two online master's in ESL: a master of arts in curriculum and instruction: English as a second language (ESL) and an online TESOL master's program. The former program is for professionals already working within the K-12 education system as teachers, administrators, or policymakers. The latter is for students who wish to teach English abroad or outside of the K-12 education system. Both programs consist of 10 courses totaling 30 credits. The programs last 1.5 years, with each course taking 7.5 weeks to complete. The ESL required courses cover topics including biliteracy development, sociolinguistic issues in bilingual education, and assessment and evaluation. Students in the ESL program complete a practicum to round out their experience. The TESOL courses include approaches to research, language acquisition, and methods of teaching English as a second language. Students in this program complete an internship and a capstone project. Applicants to either program need a bachelor's degree in any field with a 3.0 GPA or better. Applications must include three letters of recommendation, a resume, and a personal statement that addresses the student's interest in the program. Applicants who are non-native English speakers must prove their proficiency with the language. ASU is accredited by the Higher Learning Commission of the North Central Association of Schools and Colleges and a member of the State Authorization Reciprocity Agreement. In 1919, forward-thinking educators and prominent intellectuals founded the New School for Social Research in New York City. The founders set out to establish a university that offered progressive educational opportunities. Now formally known as The New School, the century-old institution houses a design school, performing arts college, liberal arts college, and graduate school. The New School holds accreditation from the Middle States Commission on Higher Education. The university offers a TESOL master's program online that comprises 30 credits and two concentration options: teaching and curriculum development. All students enroll in 15 credits of core coursework, including language analysis for teachers; phonology, lexis, and syntax; and principles of learning and teaching. Students also complete a one-credit e-portfolio and a two-credit practitioner research course. The program requires students to complete a practicum or professional project in their concentration prior to graduation. Online courses for the MA TESOL program follow an asynchronous delivery format. Full-time students typically graduate from the program in one year; part-time students usually earn the degree in 20 months. Online MA TESOL students can apply for the same scholarship opportunities as on-campus students, including the Mayor's Graduate Scholarship and the Organization of American States Scholarship. Biola University began in 1908 as the Bible Institute of Los Angeles. The school achieved university status in 1981 when it officially became Biola University. Biola University hosts over 6,000 undergraduate and graduate students and offers more than 150 programs at the bachelor's, master's, and doctoral levels. The school is accredited by the Western Association of Schools and Colleges Senior College and University Commission. Biola University offers a TESOL master's program online that comprises 36 credits; students must complete at least 24 credits at Biola. Students typically earn the degree after four semesters of full-time enrollment or 6-8 semesters of part-time study. The university offers a one-year accelerated master's program for students with a bachelor's degree in TESOL. All students must enroll in a three-credit foundation course on the Bible and theology. The core curriculum includes courses in materials evaluation and preparation; second language acquisition; vocabulary learning and teaching; and ethics, values, and intercultural communications for TESOL professionals. TESOL courses completed with a 2.9 GPA or below are not counted toward the degree. The university credits all online MA TESOL students with a one-third tuition reduction once they register for courses. In 1894, the Lutheran Church - Missouri Synod founded the Evangelical Lutheran School Teachers Seminary, the institution that later became Concordia University Nebraska. Today, the university offers over 75 undergraduate degrees and more than 25 master's programs. Out of 172 schools included in the Best Regional Universities Midwest Rankings compiled by U.S. News & World Report, Concordia University Nebraska ranked #35. The university holds accreditation from the Higher Learning Commission. Concordia University offers three online master of education degrees that focus on English instruction: an M.Ed. in curriculum and instruction (39 credits) with an emphasis on ESL/ELL; M.Ed. in TESOL (36 credits); and M.Ed. in literacy (51 credits) with two emphasis areas — ESL and reading. All courses follow an eight-week delivery schedule. All three programs require students to complete a three-credit capstone course. Students pursuing the M.Ed. in TESOL can take one course at a time and earn the degree in two years or opt for the fast-track program that they can complete in 18 months. The M.Ed. program in curriculum and instruction features coursework that meets the requirements for ESL/ELL endorsement certification in Nebraska. To earn the M.Ed. degree in literacy education, students must complete a field-based case study in addition to a capstone project. Founded in 1883, the University of North Dakota predates the establishment of the state by six years. Its initial graduating class consisted of eight students. The university currently enrolls close to 14,000 students and offers more than 225 undergraduate, graduate, and certificate programs. U.S. News & World Report ranks the university as #61 in its Best Online Graduate Education Programs report. UND holds accreditation from the Higher Learning Commission. The University of North Dakota offers an ELL master's program online comprising 35 credit hours, including 12 credits of major coursework, six foundation credits, and six credit hours in the cognate or focus area. Students who complete the program earn a master of education degree. The M.Ed. is usually the highest credential held by TESOL teachers. The courses for the M.Ed. degree follow an asynchronous delivery format without on-campus requirements. Online students pay the same per-credit tuition regardless of residency. The program caps mandatory fees (not tuition) at 12 credits per semester. The M.Ed. in ELL curriculum includes courses in literacy instruction for English language learners, ELL methods and material, and research and advocacy in TESOL. Students must complete a 90-hour field experience and an independent study or scholarly project prior to graduation. Most students earn the M.Ed. in six semesters. Established in 1870, Canisius College hosts over 3,700 undergraduate and graduate students from 28 countries and 44 states. The institution offers more than 100 majors and 34 master's programs. It gained accreditation from the Middle States Association Commission on Higher Education in 1921. U.S. News & World Report includes the college in the Best Regional Universities North Rankings (#23 out of 196 schools). The School of Education and Human Services at Canisius College offers a 30-credit TESOL master's program online designed to prepare students for TESOL certification in New York. The school also offers a non-certification track. The program holds accreditation from the Council for the Accreditation of Educator Preparation. Eight courses comprise the program's core curriculum and cover topics like linguistics, literacy, and second language acquisition; cultural perspectives in multilingual education; evaluation and assessment in bilingual/TESOL education; and TESOL methods and materials. The program requires students to complete a field practicum prior to graduation. Canisius prefers applicants with a minimum 3.0 GPA; students with lower GPAs are considered on a case-by-case basis. Applicants must submit transcripts and GRE or MAT scores. The University of Missouri began in 1839 when residents of Boone County pledged money and land to build a new state university. Today, the university hosts 30,000 students from all 50 states and more than 100 countries. Mizzou offers over 300 academic programs and comprises 19 colleges and schools. It holds accreditation from the Higher Learning Commission. U.S. News & World Report ranks the university's online graduate education programs #38 out of 311 schools. Mizzou's College of Education offers a master of education degree in learning, teaching, and curriculum with a TESOL emphasis. Students can earn the degree completely online. The degree consists of 33 credits, including 21 credits of TESOL coursework. All students enroll in two foundation classes: a prerequisite course in classroom research and a course in human learning. Students also complete six elective credits. Part-time students usually earn the M.Ed. in two years. Applicants need a bachelor's degree from an accredited college or university with a minimum 3.0 GPA during the last 60 hours of undergraduate enrollment. Additionally, applicants need second language proficiency and at least six months of teacher experience as a professional instructor or volunteer. The program requires GRE scores taken within five years of the application date. Mizzou's College of Education currently holds candidate membership status from the Teacher Education Accreditation Council. Sam Houston State University began in 1879 as the first training school for teachers in the southwest. The university now enrolls over 20,000 undergraduate and graduate students and offers more than 80 bachelor's degrees, over 50 master's programs, and six doctoral degrees. SHSU holds accreditation from the Southern Association of Colleges and Schools Commission on Colleges. U.S. News & World Report includes the school in its Best Online Graduate Education Programs report (#46). SHSU offers a master's in TESOL online through the School of Teaching and Learning without on-campus requirements. Graduates earn a master of education degree. The curriculum comprises 30 credits and includes foundational courses on second language acquisition and development; applied linguistics in ESL/EFL settings; and social, cultural, and language influence on learning. Additional course offerings include second language assessment and digital literacy and pedagogy. Online courses for the M.Ed. program follow a regular semester schedule and run for 7.5 or 15 weeks. The program holds accreditation from the National Council for Accreditation of Teacher Education. The school offers several scholarship opportunities for online students. McDaniel College began in 1867 as Western Maryland College with 37 undergraduate students. An independent liberal arts college, the school was one of the first coeducational institutes of higher learning in the country. Western Maryland College became McDaniel College in 2002 and currently enrolls more than 3,000 undergraduate and graduate students. McDaniel College holds accreditation from the Commission on Higher Education of the Middle States Association of Colleges and Schools. The college offers a TESOL master's program online for certified Maryland teachers who wish to earn a TESOL credential. The program does not lead to initial teacher certification. Graduates earn a master of science degree. The undergraduate and graduate education programs at McDaniel College hold accreditation from the Council for the Accreditation of Educator Preparation. The MS in TESOL comprises 36 credit hours and does not include on-campus requirements. Students enroll in 27 credit hours of required coursework in subjects like principles of language acquisition, issues of inclusive education, and methods in teaching reading to English learners in different content areas. Students complete the remaining course requirements through nine credit hours of approved electives. Students complete a capstone project or write a research thesis as the culminating experience. Wilkes University hosts over 4,400 undergraduate and graduate students from more than 11 countries and 19 states. It holds accreditation from the Middle States Commission on Higher Education. U.S. News & World Report includes the university in the Best Regional Universities North Rankings (#68). Wilkes University offers a master's in TESOL online that prepares students with instructional level one or two certification to teach or serve as K-12 administrators in public schools. Graduates earn a master of science degree and ESL program specialist certification. The MS in TESOL comprises 30 credits, including courses on intercultural communication for language teachers, sociolinguistics and second language acquisition, computer assisted language learning, and ESL teaching and evaluation from theory to practice. Applicants need a bachelor's degree with a minimum 3.0 GPA from an accredited college or university. Students can transfer a maximum of six credits towards the MS degree. Although the university gives students up to six years from the date of initial enrollment to complete the degree, most students graduate from the program within two years. Established in 1971, Liberty University's initial enrollment comprised 154 students. By the time the school achieved university status in 1985, it supported a residential student body of 15,000, with thousands more enrolled online. Liberty University currently offers more than 600 certificate, bachelor's, master's, and doctoral degrees. It holds accreditation from the Southern Association of Colleges and Schools Commission on Colleges. Liberty University offers a master of education degree in curriculum and instruction through the School of Education. The program offers 11 specializations, including one in English. Students can earn the degree completely online in 1.5 years. The 36-credit program includes 15 advanced education core credits, 15 English cognate class credits, and six professional coursework credits. The English specialization includes courses on composition studies, English as a world language, and studies in world literature. Online courses follow an eight-week, asynchronous delivery format that allows students to access course components at any time. Students can transfer up to 50% of the M.Ed. credit requirements from another accredited program or school. Applicants need a bachelor's degree with a minimum 3.0 undergraduate GPA. The School of Education holds accreditation from the National Council for Accreditation of Teacher Education (now the Council for the Accreditation of Educator Preparation). The Lutheran Church - Missouri Synod founded Concordia University Chicago in 1864 as a teachers' college. Today, Concordia University hosts over 5,000 undergraduate and graduate students and offers more than 100 areas of study. Concordia University holds accreditation from the Higher Learning Commission. Concordia University offers a master's in TESOL online through the College of Education. Graduates earn a master of arts degree. The program comprises 30 credits and includes courses on language and linguistics, TESOL curriculum planning and methodology, and teaching English to adult learners. The program requires students to complete a master's capstone project prior to graduation. In addition, all MA TESOL students undergo a teaching practicum where they serve as volunteer English teachers for non-native English speakers. The practicum allows students to apply classroom theory to real-world teaching situations and develop practical teaching skills. Applicants submit transcripts, a statement of purpose, and two letters of recommendation. The College of Education at Concordia University Chicago holds accreditation from the Council for the Accreditation of Educator Preparation. Heeding a request from the Catholic bishop of Brooklyn at the time, the Vincentian Fathers founded St. John's College in 1870 as a day college for diocese youth. The school achieved university status in 1906 and officially changed its name to St. John's University. St. John's University currently enrolls more than 21,000 students and offers over 100 programs of study at the certificate, bachelor's, master's, and doctorate levels. It holds accreditation from the Middle States Commission on Higher Education. U.S. News & World Report includes the university among the Best Online Graduate Education Programs (#61). The School of Education at St. John's University offers two master of science programs with a focus on teaching English to non-English-speaking populations. The MS degree in TESOL consists of 33 credits and features two tracks: one for students with New York State Certification and another for students without certification. Students can earn the degree completely online. The MS degree in education comprises 48 credits and focuses on childhood education and TESOL. The school designed the program for students with a bachelor's degree in a non-education field. Students can pursue only 50% of the program online (the TESOL coursework). The MS features certification and non-certification tracks. Lipscomb University began as Nashville Bible School in 1891 with an initial enrollment of nine students. The school changed its name to Lipscomb College in 1918 after the death of David Lipscomb, one of the school's founders. When the school achieved university status in 1988, it changed its name to Lipscomb University. Today, the university offers more than 200 fields of study at the undergraduate level, 24 master's degrees, and three doctorate programs. It currently enrolls over 4,600 undergraduate and graduate students. Lipscomb University holds accreditation from the Southern Association of Colleges and Schools Commission on Colleges. The university offers an ELL master's program online that comprises 10 courses, four of which fulfill the coursework requirements for the ELL endorsement. Graduates earn a master of education degree. The degree consists of 30 credits hours: 15 hours of leadership core courses and 15 hours of English language learner coursework. All M.Ed. students enroll in two non-credit courses that are free of charge: orientation to M.Ed./MS/Ed.S. programs, taken at the beginning of the program, and a graduate seminar, taken during a student's graduating year. Students must complete a capstone project comprising 20 hours of field work prior to graduation. The university gives M.Ed. students who are currently working in the field a 26% tuition discount. The following section considers course offerings and graduation timeline. A master's in ESL online degree plan consists of foundational classes, advanced topics in a concentration, and practicum experiences. Within these three categories, substantial variation exists, so students should consult their prospective schools' advisers about specific competencies. The list below contains five common classes for graduate students in this field. Second Language Theories: The course focuses on understanding and describing language, including its development and contemporary uses. Students delve into grammar, applied phonetics, and acquisition theories. They also explore the role of dialect in the classroom and the relationships between first languages, second languages, and a student's cultural upbringing. Language Learning and Teaching: In this class, students learn the foundations of curriculum and instruction, including planning models, data-supported teaching, and resources for decision-making. By analyzing various methods of ESL instruction, students develop a substantive understanding of communicative techniques for teaching grammar and language functions. Advanced topics include classroom management and methods of assessing learner response for curricular improvements. Assessment Theory and Practice: This course covers the central issues in ESL assessment, including standardized and high-stakes testing. Students also analyze the roles of exams in relation to course placement, exit standards, and summative and formative assessments. Finally, the class trains students to make adaptations in their assessments to meet differing learner needs. Technology Enhanced Instruction: Building on basic computer skills, this class trains students to implement technology for different instructional settings, from kindergarten classrooms to adult continuing education. Topics include wikis, digital stories, and online course management platforms like Moodle and Blackboard. Students also learn to adapt new media technologies for high- and low-tech teaching environments. Cultural Issues in the ESL Classroom: In this advanced class, students explore the ways educators can enhance the cultural dimensions of ESL instruction through research-supported training techniques. The course emphasizes the importance of cultural identities and the social foundations of language education, particularly among ethnic minority groups. Students also learn how to apply discourse-oriented models to analyze cross-cultural interactions. How Long Does It Take to Get an Online Master's in English Language Learning? The best online ESL master's programs generally take two years to complete, requiring students to accumulate at least 30 semester credits. Degree candidates may expedite graduation by enrolling in accelerated pathways, obtaining their credentials in as little as 12 months. These intensive programs necessitate full-time commitment and, often, on-campus residencies. They also require applicants to possess prior college work and relevant career experience. Classroom practicum represents a cornerstone of education and teacher preparation programs. By teaching students, degree candidates cultivate invaluable skills in classroom management, lesson planning, and, perhaps most importantly, effective self-evaluation. Colleges and universities usually allow online students to fulfill practicum requirements in their communities through approved institutions and/or current employers. Program structure also dictates timeline. Most online programs enable students to pace their degree plans individually, taking as few or as many classes as they need each term. This freedom allows working professionals to cater their academic schedules to busy work and family lives. However, certain schools operate cohort learning, in which learners take one course or two courses at a time and advance through the program at the same rate as their peers. Certification represents an important component of a degree. With rigorous standards, certification programs ensure teachers can handle leading a classroom, creating a curriculum, or working with foreign language speakers. Each state has its own set of requirements for ESL teachers. Applicants must apply for a teaching certificate and subsequent certification through the state's board of education. ESL Teacher certification requires a set amount of teaching hours. TEFL certification is designed for ESL instructors working in non-English speaking countries. It prepares teachers to instruct non-English speaking students and teach English as a foreign language. Instructors teaching English in a native-English speaking country should apply for this certification. TESOL certification provides them with the knowledge they'll need to lead non-English speaking students and help them improve their conversational skills. To earn valid ESL master's degrees, online students need to attend postsecondary schools that hold national or regional accreditation. Colleges and universities become nationally accredited through the Council for Higher Education Accreditation (CHEA) and the U.S. Department of Education (ED). They obtain regional accreditation from one of seven authoritative bodies, depending on location. For example, schools in Michigan become regionally accredited through the Higher Learning Commission, while New York institutions apply for this designation from the Middle States Commission on Higher Education. In addition to national and regional stamps of approval, online master's in English language learning programs can pursue the support of the Council for the Accreditation of Educator Preparation (CAEP). Formed in 2013 through the consolidation of the National Council for Accreditation of Teacher Education and the Teacher Education Accreditation Council, CAEP operates five standards of academic excellence: content and pedagogical knowledge; clinical partnerships and practice; candidate quality, recruitment, and selectivity; program impact; and provider quality, continuous improvement, and capacity. CHEA was formed in 1996 as a nongovernmental organization that provides institutional members with developmental services and financial resources. While CHEA works closely with the ED, the council maintains its own accreditation standards. CHEA also backs 60 partner organizations to facilitate regional and specialized accreditation. Established in 1980, the ED is a cabinet-level department of the national government. Because of the decentralized structure of U.S. education, the ED does not create colleges and universities directly. Rather, the department conducts research and ensures higher education institutions abide by federal regulations. Furthermore, schools cannot access government funding, including student loans and grants, without the ED's support. Students can find more information about accredited schools on the CHEA and ED's websites. The table below displays median salaries for five ESL careers. These numbers represent calculations made from available samples and do not necessary factor in deviations caused by location, employer, and an individual teacher's qualifications. Prospective students should use this information as a starting point for their own career research. By earning an accredited online master's degree in ESL with certification, students can pursue careers in teaching and educational administration. Teachers can work for K-12 and postsecondary institutions or for companies as employee trainers. Administrative roles also exist with these employers. With additional training and certification, ESL educators may occupy positions as curriculum developers, program evaluators, and freelance consultants. Unsurprisingly, ESL professionals often work abroad as translators and foreign teachers. While these diverse careers require differing skills and experience levels, ESL educators should possess the patience and empathy necessary for student-centered instruction and support. Working for schools, businesses, and government agencies, instructional coordinators develop, implement, and evaluate curricula. These educational administrators also support teachers by scheduling training and professional development programs. They may take on human resources roles, managing budgets, maintaining employee benefits, and evaluating performance. Instructional coordinators often act as liaisons between teachers, students, and management. ESL teachers teach language skills to nonnative speakers in a traditional classroom or corporate training setting. In addition to teaching students how to read, write, speak comprehensive English, these educators act as cultural ambassadors, ensuring learners understand common customs and expectations. Many ESL teachers also work as curriculum developers. Typically employed by K-12 schools, guidance counselors assist students in achieving their educational and career goals. Because they help students schedule classes and prepare for college, these professionals possess extensive knowledge of academic programming and career pathways. Guidance counselors also assist with behavioral or social problems, conducting assessments and connecting students with resources and services. These professional communicators work for various employers, from schools and business, to nonprofit organizations and government bodies. Translators act as the link between people who speak different languages, facilitating communication in written and oral forms. On top of language understanding, translators provide insight into a culture's history and customs so clients can better form connections with each other. These professionals provide general education or skill-specific instruction to adult learners, with careful regard to their students' busy schedules and career development. They may work in community centers and colleges, preparing students for the GED or teaching personal enrichment courses. Adult education teachers can also occupy roles as corporate trainers in areas like emotional intelligence, business writing, and workplace efficiency. Professional organizations provide unmatched resources and support to ESL educators. Several organizations focus on bilingual and multilingual education and issues, and they advocate for the rights of multilingual students. Members benefit from the opportunity to network with ESL educators in the United States and beyond. They also have access to online courses, career centers, and teaching materials. The membership process for each organization varies (see their websites for more information). Open to anyone working in the field of English language teaching, TESOL membership comes with access to professional learning communities. Members collaborate in 21 special interest groups, including elementary education, teacher educator, and computer-assisted language learning. TESOL also facilitates virtual seminars, online classes, and a comprehensive career center where professionals can seek guidance and search job listings. Founded in 1975, NABE works to bolster excellence in bilingual and multilingual education. Through the association's Equity Institute, educators can present research, learn from experts, and network with peers. NABE also hosts symposiums on topics like applied linguistics and global children's rights. Additional resources include research journals, online forums, and a career center. Established in 1967, ACTFL boasts over 12,500 members, who connect through mentorship programs, national conferences, and private forums. The council also facilitates community groups centered on such topics as standardized testing, educational research, and working abroad. Furthermore, ACTFL delivers career resources, in-person workshops, virtual learning modules, and four certification programs in areas like oral and writing proficiency assessments. To earn a master's in ESL, online students invest substantial amounts of money and time. Fortunately, diverse financial aid exists for all distance learners, from recent high school graduates to returning students. The Free Application for Federal Student Aid (FAFSA) enables U.S. citizens and eligible non-citizens to obtain need-based grants, low-interest loans, and work-study positions. Due to the national teaching shortage, educators benefit from TEACH Grants and loan forgiveness programs through the government. Ample private scholarship opportunities also exist from private companies, nonprofit organizations, and religious institutions. Approximately two-thirds of today's college students rely on loans to fund their education, but consider some of the overlooked financing options to reduce your overall student debt. Completing the Free Application for Federal Student Aid (FAFSA) serves as a crucial first step for any student with financial needs. Our FAFSA guide features a step-by-step rundown on the process and answers to several frequently asked questions. Financial aid for online learning correlates with the same for campus-based learning, but that hasn't always been the case. Learn about recent changes and funding opportunities available to online students. Online college programs represent flexible, affordable options for single parents interested in earning a degree and securing their family's financial future. We've compiled a list of scholarships, grants, and other financial aid options geared toward single moms and dads. The government and other organizations reserve millions of dollars in free money for U.S. military personnel, but much of it goes unused. Learn more about grants, scholarships, and other financial aid opportunities available to veterans, active-duty service members, and reservists.